Crazy4laptops needs to extend a WiFi network throughout a "rather long house." He asked the Networking forum for advice. There are plenty of ways to extend a connection. Some are easier than others. One thing you can try, especially if you're good with your hands, is to build yourself a better antenna more suited for your needs. For instance, you can build a parabolic reflector that will focus the beam in a particular direction. Wireless repeaters provide another option. These are basically range extenders. You locate them at the outer range of the router's good signal, and they repeat the signals they receive. But of all the various options, I come down strongly on the side of HomePlug technology. The HomePlug/Powerline standard sends network data over a building's AC power at near-Ethernet speeds. 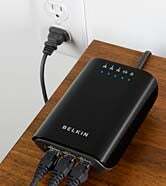 I've yet to find another networking technology as easily plug-and-play as HomePlug. Are there any downsides? I've read about interference problems with ham radios and wireless mice. I use a wireless mouse near a HomePlug adapter, and have had no problems. Your standard HomePlug "starter kit" comes with two devices, each of which plugs directly into an AC wall socket. One of these goes in the same room as the router, and connects to it via ethernet. The other goes into whatever room you want Internet; this one generally comes with one or more ethernet connections. But Crazy wants to extend WiFi, not ethernet. For that, you can buy HomePlug WiFi adapters that have antenna rather than or in addition to ports. In my experience, these aren't quite as plug-and-play as the ethernet devices--you have to enter your network's name and password--but they're not difficult, either. And yes, several companies make HomePlug wireless startup kits.